This creamy vegan potato salad is a summer staple. It has all of the bold flavor you’d expect in a potato salad but is made with a healthier (and vegan) cashew mayo base. It’s the same mayo that I use in my classic coleslaw recipe and my vegan ranch dressing! Cashews are perfect for creating that creamy texture that dairy or egg based dressings/sauces are known for. Choosing the right potato is extremely important if you want to make the best potato salad. I avoid using the common Russet potato when making my vegan potato salad because it has a flakier skin that tends to fall apart while boiling and gives a less desirable texture. Instead go for smaller Yukon Gold potatoes or Red potatoes. They have a waxy skin that keeps its integrity while boiling and provides a better texture (in my opinion) for a potato salad. Some people are advocates for boiling the potatoes whole and dicing them afterwards to get a sweeter flavor, however, I’ve never been able to tell the difference. I prefer to cut my potatoes into bite sized chunks before boiling because it speeds up the boiling process and helps the potatoes cook more uniformly. To cook the potatoes, cover them with 1/2 an inch of water and bring to a boil. Once boiling, reduce the heat to a slow boil or simmer and cook the potatoes 15-20 minutes or until a fork passes easily through them. Don’t overcook them or you’ll end up with mashed potatoes! Be sure to add salt to the water! I use about 1 tsp. The salt will help bring out the natural flavors in the potatoes. While the potatoes cook prep your veggies! Red onion and celery are what is used in traditional potato salads but feel free to experiment. I also like to use chives because…well, chives were just made for potatoes. Whether it’s a baked potato or potato salad, chive’s flavor just works. Dill and parsley are also common herbs that you’ll find in potato salads. If you choose to go with dill be careful! It has a much stronger flavor so a little goes a long way. Once the potatoes have finished cooking drain them and set aside to let cool. I drizzle the potatoes with 2 tbsp of red wine vinegar. The potatoes soak up the vinegar giving them a tangy flavor that contrasts well with the dressing. While the potatoes cool, prepare the vegan potato salad dressing. Potato salad traditionally has a mayo and mustard based dressing with an added crunch from onion and celery. As you can see there’s lots of variety out there so feel free to get creative! Add all of the dressing ingredients to a bowl and whisk until well combined. Then pour the dressing over the potatoes and toss until well coated. Garnish with chives or herbs of your choice and enjoy! Some people prefer their potato salad room temperature while others prefer it cold. Either way you can’t go wrong with the bold flavor of this creamy and delicious side dish! Looking for another delicious summer side dish? Try out this super easy vegan pasta salad or spice things up with these rainbow spring rolls! This creamy vegan potato salad is a summer favorite. 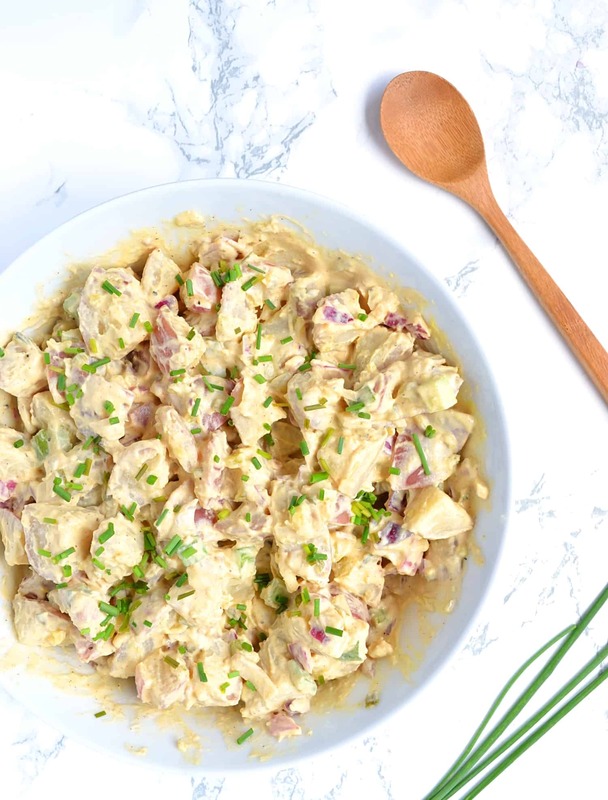 It looks and tastes just like a classic potato salad but has a healthier plant-based cashew mayo dressing! Tangy, creamy, and delicious, it’s a crowd-pleaser for vegans and non-vegans alike!